Encryptik has coherently achieved success in the financial industry, along with winning over various other sectors like; insurance, healthcare, government, etc. 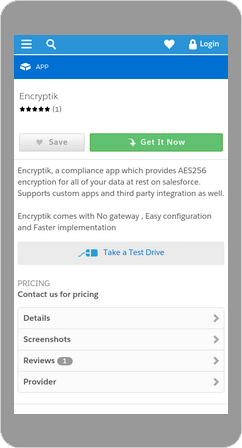 Your critical data is always kept safe in cipher format within the Salesforce database utilizing the highest encryption algorithm AES 256. Encryptik, enables enterprises to achieve end-to-end protection platform. We provide organizations prominent security access, also our products offer authentic protection and insight to reduce risk across your entire organization.